Surgery can be as much an art as science and sculpting cement around an implant can be both. But with the wrong tool - a metal tool, a surgeon can risk scratching the implant, compromising the long-term outcome of the surgery. What is our real solution to this real problem? Whitney Medical Solutions' green No-Scratch Whitney Sculps Knife. 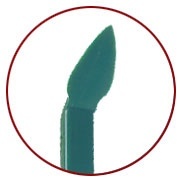 The pointed tip of the green Sculps Knife makes it easier to reach all crevices and angles to remove excess bone cement. 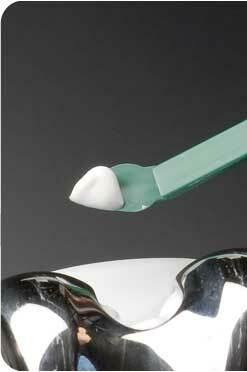 The sharp edge allows better sculpting of cement and this edge can also be used to expertly apply cement to surfaces. The safe and easy-to-use, disposable No-Scratch Whitney Sculps Knife is perfect for quickly applying, manipulating and removing bone cement during hip and knee replacement surgery. The knife is made of sturdy plastic reducing the risk of damage to the prosthesis due to metal instruments. Our one-time use curettes are economical and save time. No need to clean or scrape dried cement from instruments. Applies, manipulates or removes cement with finger tip precision.